First among the latter might be an elementary lines-per-stop fraction, or the total of all lines per stop – 731 – divided by the number of recorded subway stops, or 421. That comes to 1.73 lines per stop, a reading that, by way of comparative example, powers it past Paris’ 1.34. Does that make the New York system the nimbler of the two, opening a sluice of option-richer travel flows from point to point? I don’t know about that, and I’d refer the matter instead to a statistician and/or urban planner. Remember that New York is by far the physically larger city, and you’d have to leave the service-optimization algorithm to the regression analysts. You might also want to sort the data by 2012 rank (or the 2012 ridership field), serving up an unsurprising but substantive demonstration of Manhattan’s hegemony. Ranks 1 through 11 are arrogated by the island’s stops, preeminent among these Times Square, the nexus of 11 – count ’em, 11 – different lines. It isn’t until you lower yourself to rank 12 that you come face-to-face with a non-Manhattan venue – Main Street, the teeming Queens terminus of the Number 7 line, a stop to which I’ve wended my way many times (New York subway lines are either numbered or lettered, by the way, a legacy of the scheme’s multi-system prehistory). But note that Main Street is also the busiest stop through which only one line runs, triggering an obvious pivot-table poser: how does station ridership covary with the number of lines tracking through its platforms? 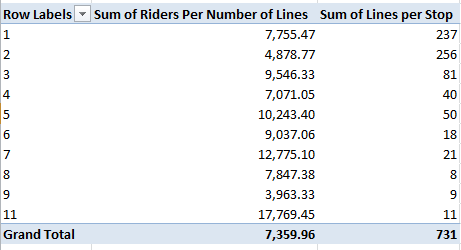 It stands to reason of course that, all things being equal, stations housing more lines will absorb the great rider population; but an average riders-per-number-of –lines station index might tell a different story. Among other things, we see that 237, or 56% of New York’s stations, feature but one line. But note that these carry strikingly more riders-per-line than those stations entrusted with two lines. Main Street again – by a rout, and note that positions one through five record stations equipped with but one line. Times Square? By this reckoning, it recedes to a diffident 22nd place. Note, for example, that Brooklyn, the city’s most populous borough, likewise enjoys the highest station count; but Queens, the penultimate borough whose residential cohort exceeds Manhattan’s by 600,000, appears to have been shortchanged – although again, station construction could not have expectably geared itself to latter-day demographic ebbs and flows. And Manhattan – the cynosure of so much of the city’s activity – checks in with the system’s highest line-per-station average. Note as well that 55% of the subway’s daily ridership passes through a Manhattan-sited turnstile, a proportion that makes a good deal of sense. Since it’s reasonable to suppose that the great bulk of Bronx, Brooklyn, and Queens weekday users head to work in Manhattan, their return trip of necessity starts in the latter borough. 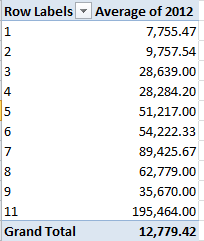 Thus the Manhattan/other-borough totals could be expected to offset each other, and they do within reason, once they’re qualified by the obvious supplementary fact that many Manhattan dwellers work in their home borough, too. And all those Manhattan-based tourists could be expected to skew the ratios too. 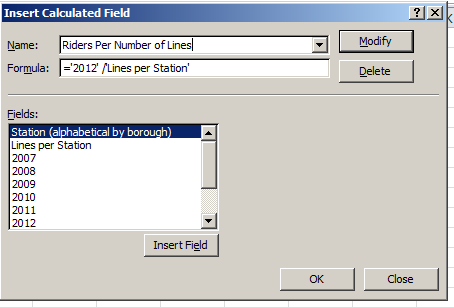 Those are borough-wide, station rider-total ranking averages. And they’re just what you expected to see, no?